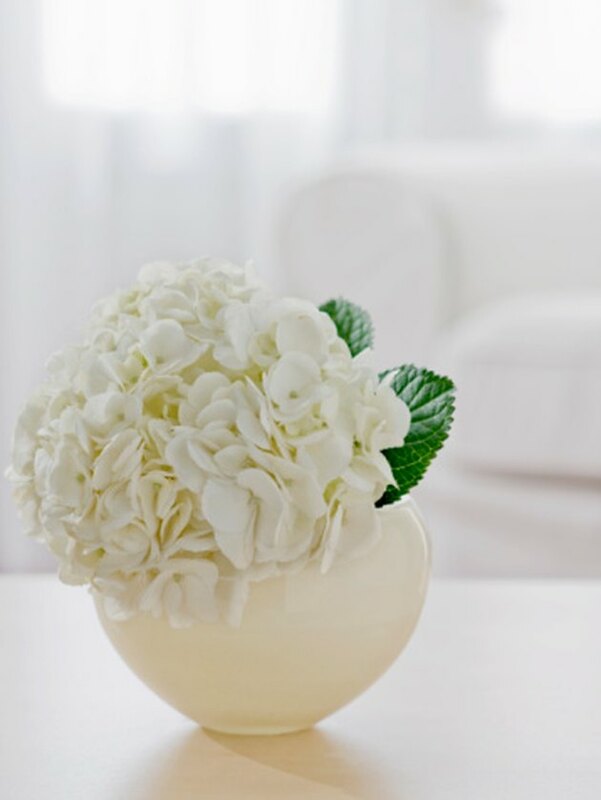 Hydrangeas, such as Annabelle, may have a 10-inch diameter white flower head. These plants have a tendency to fall over on their slender stems, especially after a rainstorm. Artificial supports protect top-heavy hydrangeas. Hydrangea with large blossoms may require support to keep from flopping over. A physical support is often not needed to prop up hydrangeas. Putting a support, such a tomato plant, in the middle of a shrub like hydrangea works but may look unpleasant. Some gardeners simply bunch and tie the stems of the hydrangea together. A short trellis system that blends into hydrangeas will not call attention to the fact that hydrangeas need trellising. Sinking the limbs of sturdy branches into the ground and tying hydrangea stalks to them with garden twine help to hold the plant upright. Hydrangea plants often flop over because pruning allows larger flowers to grow. When pruning hydrangeas, measure to a point 18 to 24 inches from the ground before cutting. The framework of old growth will support the weight of the flowers better. At the same time, the flowers that emerge will not be so large that they fall over. When to Prune Limelight Hydrangea?